The only commercial fiction new book store on the island--Hastings--is closing!! Oh noes!! Or, if I want to be a bit more literary, alas and alack! There is another new book store downtown, but it's an independent, and it pretty much carries only lit'rary books, or books about the island, or maybe books written by people who live on the island. It does not carry books that will feed my jones for fantasy, science fiction, mystery, or--most especially--romance. I'm not sure how I'm going to deal with this. I used to drive the 60 miles into Amarillo once a week, but I'm crossing the causeway only about once per month, these days. I may be buying more from catalogs or on line. We'll see how it works out. Actually, it was a whole beautiful weekend. Saturday was Absolutely Gorgeous, here in island-land. A cold front blew in on Sunday, but it was still really nice. Just jacket nice, instead of shirtsleeve nice. Oh, I have to share--I went out one day last week to walk along the beach, instead of riding the bicycle. Wore the flip-flops, since it's been warming up, and did my usual "walk barefoot on the sand, put on flipflops to cross the jetties" trick. The weather was beautiful--just breezy enough to be cool and comfortable. But that water was COLD!! And I didn't even get into the water. I just walked on the wet sand. Still cold. Cold, Cold COLD! The boy and his girlfriend and the granddog came to visit and they actually went to the beach and got in the water. Brrrr! I have pictures. (Of Dolly the dog, not any people) I'll have to download and post them. The writing is chugging along. I feel like I'm not getting anywhere, but really, I am. I guess I feel that way because I keep having to go back and fill things in. What I wrote today, I'm worried I may have to take out and condense. I feel like I ought to Know what to leave out and what to put in when I write it...but I don't. I just throw it all in, and then have to slash and burn when it comes time to revise. Less planning, less clothing, more doing. Birdwatching stuff--skip this if you're not interested, but I just saw a pair of birds I'd never seen before. It was apparent they were dove--dove have a pretty distinctive appearance. They were sitting in my driveway when I got off work today, and fluttered up to the neighbor's fence as I drove up. They were quite reddish-brown, but even more distinctive--the outer half of their wings were a rusty red. Even redder than their bodies. And they were small. a fair bit smaller than Mourning Dove and a whole LOT smaller than Rock Dove, AKA Pigeons. So I came inside to look them up, and found that they are Common Ground Doves. You can't see the red wings in this picture, but the color of this guy's beak--that's about how red the wings were. Ground dove mostly live in Mexico, but they come this far up into the U.S. and they don't migrate. Pretty cool, I think. I'm still tired. Went to help unpack the parents. Totally forgot sticky notes, but the sister had them at her house, so my niece made them out for the cabinets. We worked like mules trying to get boxes unpacked and things put away, at least in the kitchen, trying to get the living room usable and the beds put together so we'd have a place to sleep. The sister and I worked. Mama was having chest pains. (She does that when she gets overworked.) The sister-in-law came over and worked too. She was the driving force to get the living room organized. The house will be good for them, but it needs more work than I realized. For instance, the master bath was demolished for remodeling, only the remodeling never got done. So the master bath has no walls, no shower stall to go with the shower head, no floor... You get the idea. The other bath works, but it's pretty worn. Then they had sewer trouble the day after I left to go home. And I'm worried about them being able to coordinate things and remembering to get it done. It really needs to be done as soon as possible. My brother-in-law is disabled, so he's home most of the time, and if the pain's not too bad, he can make phone calls and help them out some. He was there organizing--we had to watch him like a hawk to make sure he didn't try to move anything, though. Downsizing will be a struggle for them--and we'll be working on some downsizing too, I think, in the next few weeks. Finished my character interviews this morning, so I'll probably get back into the writing (I hope) tomorrow. This is for Old Spirits. Got to get rolling on that. Oh! The house has azaleas outside the breakfast room window. I've always loved azaleas, but have never lived anywhere they would grow. I'm going to find my clippers and go out and cut some. Maybe a rose, too, if one of them looks good. My life is full of stuff. Stuff I have to do. Stuff I want to do. Stuff I want to read. Stuff I have to do something with. Stuff I have to clean or put away or fold up or...something. I really need to start writing Old Spirits, but I have too much stuff to do. Tomorrow, I'm leaving to go meet the parents at their new house and help them get unpacked and organized. I need to remember to take lots of Post-it Notes to label their kitchen cabinets and drawers, so they can remember where they've put things. A large part of this move is because both of them are starting to have trouble with their rememberers. They did pretty good while it was just Mama forgetting stuff, but now Daddy's started having trouble, so we're happy they can move so close to one of us children. But I really need to be there to help with the unpacking. Anyway, there's a lot of traveling and a lot of moving in my future. I have confirmed that I'm going to ApolloCon, the SF/Fantasy con in Houston, in June. I will probably go to RWA National in San Francisco at the end of July (need to find a roomie). I'm still debating whether I want to go to ArmadilloCon in Austin in August. There's a FenCon in Dallas in September, but I have to see if the dates conflict with a potential trip to New York the fella's invited me on. There is the possibility that Tor will have galleys/ARCs of New Blood for me to sign at the Tor booksigning in San Francisco. I'll let you know if that pans out. I did get all my RITA books read and judged. An interesting experience, to say the least. I read a lot of books outside my usual reading comfort level--and liked them. Next week. The writing will begin, next week. Definitely. The fella's out of town. I've caught up on all the stuff. (I think.) I can write. There is no age limit. On either end. Hello, my name is Gail and I'm a geeky fan girl. Woman. Whatever. So, yeah, I didn't make it by last week. I tell ya, this dayjob is really eating into my time. Along with everything else in my life. Met up with a friend who's also a fan. Hung out on Sixth Street, listening to music and watching all the wannabes and gonnabes and already-ares mingling. And the guy showed up. And I got to chat with him a bit. 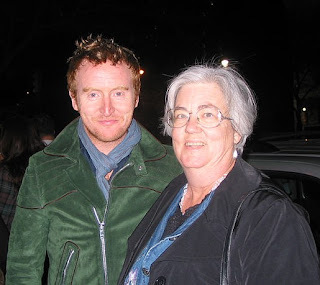 And take a picture of us together, just to prove that, yes, I met Tony Curran. I don't care that you don't know who he is. I do. And I was such a totally geeky fan girl, I forgot 3/4 of the things I wanted to ask him. But I was there. I didn't get in to see the movie. They let in people with badges before they let in the peons who only want to see one thing, and there were too many with badges who wanted to see it. At one point, someone came out asking whether there was any more press, and I almost claimed to be a stringer for the paper I work for... And I found out today that I should have, and that the paper would probably have published any story I wrote about it. I have to go back this weekend to meet the folks at the house they're moving to, so I can help them unpack and get organized. The movie is playing again this coming Saturday night. I could go again, and get in to see it this time, and write an article next week... I'll let you know what happens. I may be too tired. I may go back home to my island. I saw bluebonnets today, blooming on the island! Spring Is Officially Here. YAYYYYY!! !